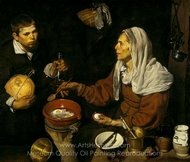 During the early 1600s, modern national identities were first being formed in Europe. 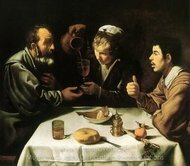 Kings from Spain to Germany and beyond used art to not only strengthen their claim to power, but also to identify themselves with the characteristics that they felt made their people great. All royal courts had artists in residence, including painters, sculptors and many others. 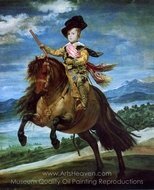 In effect, the crowned heads of Europe took it upon themselves to produce culture through beauty -- and there is no better example of this than the high Baroque period from which Diego Velázquez paintings come. 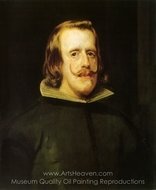 Paintings by Velázquez are astonishing examples of royal power given form. 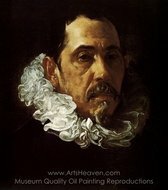 Yet Velázquez himself had an undeniable independent streak shown in all paintings. 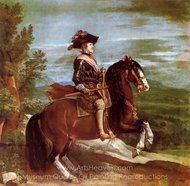 Diego Velázquez paintings are numerous and versatile, but virtually all of the great paintings by Diego Velázquez are associated with the royal house of Philip IV. 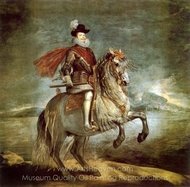 Philip, who led Spain during the enormously difficult Thirty Years War, was very attentive to the royal prestige of himself and his family. 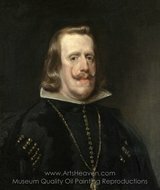 Velázquez paintings were intended to confer upon the king the might and wisdom that the beleaguered Spanish people expected. 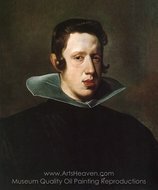 Velazquez's works include dozens of portraits of Philip IV and all the members of the royal household. 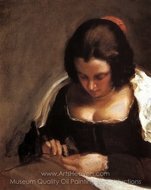 His extraordinary artistic achievements were a template for later artists in both the Realist and Impressionist schools, and more than a hundred works are attributed to him or known from records -- although some have been lost. 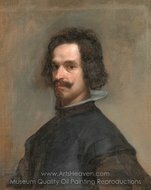 Velázquez traveled as far as Italy under King Philip's patronage, but spent most of his life in Madrid. 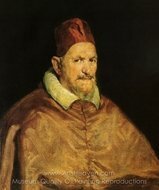 Excelling in portraiture, he was in demand among many nobles of the court. 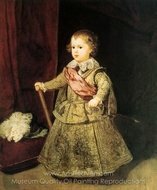 In some cases, Diego Velazquez paintings that seem to focus on the nobles or royals may actually be set pieces allowing the artist to explore the subjects of his personal interest. 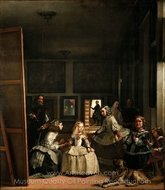 Among all the paintings of Diego Velázquez, his most famous -- the masterwork entitled Las Meninas, may be in part an example of this. Like many of his paintings, there are signs of the artist's iconoclastic streak. 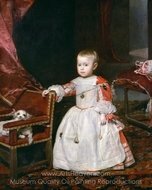 He pays immense attention to the background, placing children of the royal household in such a way that they are pictorially dwarfed by other elements -- and by the artist himself on the left. 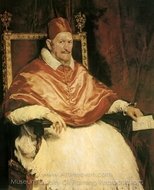 Paintings by Diego Velázquez influenced many artists, such as Picasso. Velázquez works are still recognized as some of the most extraordinary examples of portraiture to ever emerge from Europe. Each work is strikingly different, so the proper placement of any one will depend upon the reproduction you select. 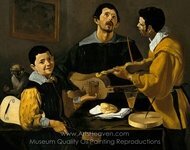 As an ArtsHeaven.com customer, you have the opportunity to buy beautiful editions of this artist's most praised works knowing your reproduction holds the same compelling expressions and colors that allowed Diego de Velázquez to leave an indelible mark in the history of European art.